Knowledge base & Resource Center. You is the acronym for Your Own Universe. Driving our development, we have a vision of smart phone owners getting only the information that is important to them. No unsolicited texts or emails, no added noise that comes with having a digital life. The YOU mobile app is literally Your Own Universe. You choose who to follow, who to share with and what’s important to you. YOU is a Messaging System Application (MSA). The YOU messaging system is a cloud based web portal that provides simple controls to send alerts, announcements and advertisements. 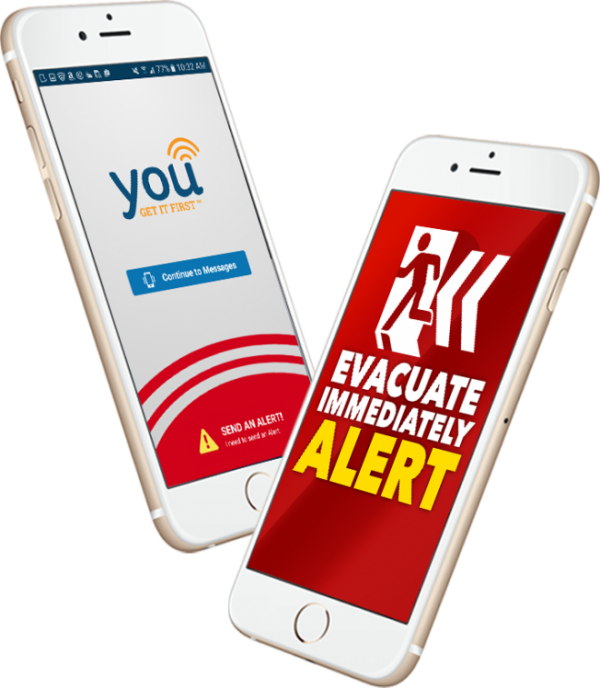 The YOU Mobile Application is the companion smartphone app that functions on all mobile devices to send alerts and receive, save, and share alerts, announcements and advertisements. The YOU App will centralize all organizations that are important to you. Whether it is an Educational, Business or Government organization, the App user will be able to select the specific organization as well as the type of messages they wish to receive from that organization. How much does it cost to download the mobile App? The mobile app is free to all users. Can I share a YOU message with my friends? Yes, you will be able to share your received messages with any contact in your phone. Can I follow other organizations? Yes, you can follow any organization that subscribes to the YOU platform. How many organizations can I follow? You can follow any organization that is important to you. It is unlimited. A MSA is a Messaging System Application. The Messaging System is a cloud based web portal providing simple controls to send messages. The YOU Mobile Application (App) is the program that operates on your mobile devices to receive, share and save messages. How long does it take to subscribe to and set up the Messaging System for our organization? Depending on the size of your organization, the set-up should take 1½ to 2½ hours to set-up, familiarize yourself with the control panel, and begin sending messages. What is the start-up fee for subscribing my organization to YOU services? Every subscription to the YOU System is custom. There is a setup fee, a subscription based on Power Users and a site fee for connecting to the local 911 Call Center. The subscription will allow your organization to be followed by every phone in our system. You will be provided on-boarding instructions, tech support, and live customer service 24/7/365. How quickly can I start to send YOU messages to followers? If you have an existing list of customers, you can upload them into the system and can begin sending messages the same day. The first message you send to existing customers will be an email inviting them to download the YOU App. How much does it cost to send a YOU message? It starts at $.01 per message per user and reduces with higher volume. The minimum fee is $10.00 for up to 1,000 messages sent. What surprise fees will I find when I subscribe? When you set up, you will be organizing users into groups and categories. 4 groups and 4 categories are included. If you choose to add more than 4 groups and 4 categories, there is an annual fee of $100 per group or category added. Yes! YOU has 24/7/365 phone support. Should you require assistance, YOU has a strong Support system including Quick Start Guide, Help, Q&A and Live Support. Will I need extensive training to use the system? No, the YOU system has been developed for ease of use. Should you require assistance, YOU has a strong Support System including Quick Start Guide, Help, Q&A and Live Support. What is the difference between Announcements and Advertising? Announcements and Advertising are very similar in the YOU system and treated the same. Advertising analytics are available for a fee of $100 and provide in-depth reports and analytics to help you with your promotional management and ROI. Appointment Functionality: Can my client really change their appointment without calling? This feature will be coming soon. Yes, your client will be able to accept, reschedule or be placed on a waiting list when setting up appointments through the YOU app. The Appointment module is simple, yet robust. Can I build a following? Can I see my followers? Yes, you can build your following. You will receive strategies to build your following in your onboarding kit. You will be able to see your following grow from the YOU web portal. If I send a YOU message, what happens if they don’t get it? If you send a YOU Alert to a recipient group and and individual does not receive it for whatever reason, the system will automatically send an email and a text message to the individual in that recipient group telling them that they have a message waiting on the YOU App. How much does the messaging system cost? Every subscription to the YOU System is custom. There is a setup fee, a subscription based on Power Users and a site fee for connecting to the local 911 Call Center. Alerts are free. Messages sent are “pay as you go” and begin at $.01 per message sent for up to 1000 recipients. If you use the system regularly, the annual setup fee does not reoccur. What kind of reports do I get when I send a message? There are many opportunities to track and verify your campaign’s performance. One report is called the “Touch Report.” As your follower views your messages, they slide them with their finger and their view will be tallied in the touch report letting you know they saw your message. Each message you send will also be summarized in a “Delivery Report”. Nearly every interaction with your database can be reported upon. Do I have to worry about spamming and privacy? Spamming is not a factor with the YOU platform. Your followers give permission to contact them by opting in to follow you. Once you have them, don’t loose them! Make sure that your messages are meaningful and provide value. The YOU platform never shares any email addresses or cell phone numbers. Privacy is taken very seriously and no exposure occurs with YOU. How much does the Appointment Module cost? Not yet an active feature, the appointment module is based on how many appointment books your organization uses. An appointment book starts at $50/month and prorates down with additional books.